This is my husband’s Favorite Dessert. Many of my friends love it as well, and are always asking me to make some Flan. People think it is a difficult dessert to make, but today I'm sharing this recipe with you and showing you that it is not that complicated and it could be very rewarding. Place Baking Pan in the stove at low to medium heat, add sugar and if using water (it makes it easier) add just a couple of drops, this may be enough. Sugar will melt slowly and you will have to move/turn the pan so that the bottom surface and a portion of the sides are well covered in caramel. Set aside. In separate bowl, mix Condensed Milk, Evaporated Milk and Vanilla Extract. Lastly add Cream Cheese, mix well but don't over do it; if you mix it to much it will create air bubbles in the flan (some people like it this way). Place caramel pan in a bigger pan to create a baño de Maria or double boiler, add warm water to the outer pan. Pour mix into the caramelized pan. Place both pans (Double Boiler / Baño de Maria) in the over for about 35 to 45 min depending on the oven you have. Test with a toothpick (if it comes out clean, it’s done). 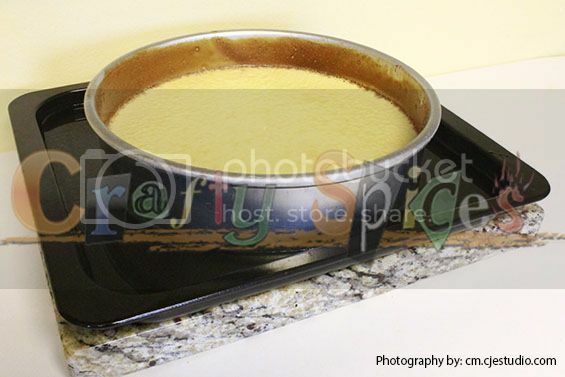 Take flan out of oven and let it cool (it will cool faster if you take out of the water and set aside), if set to cool in the water it will continue to cook since the water is still hot. Take large serving dish and place it as a lid, turn over (up-side down), be sure it is all out before lifting pan, and voila. 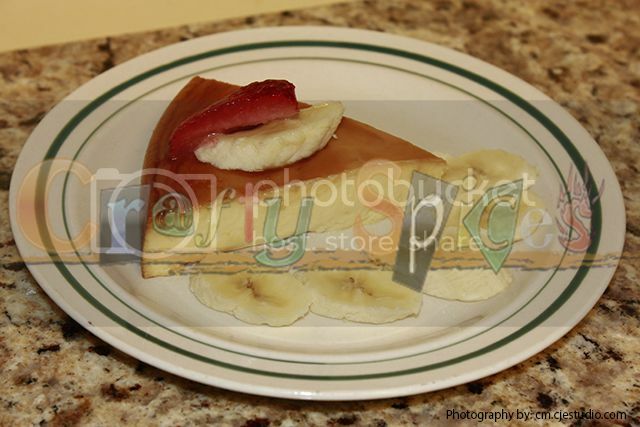 Optional: add fruits over flan, as topping, add more caramel, or serve as is. Final touches are all up to you, be creative. If you like this recipe, tell us all about it. Thank you for this recipe, I purchased all the ingredients and will be trying it tomorrow. I'm glad you are going to give it a try, please let us know how much your family ends up liking it :). Or feel free to drop us any questions that you may have. Hi Jamie, you are welcome, and thank you for hosting the hop and for stopping by to check out the flan recipe. I'm sure I will visit again. Very good girl, that flan looks so,so gooddddd!!!!!!! !!! Sigue mandando esa buenas recetas. Thanks so much for visiting Local Sugar Hawaii. I so love that we can share that little ride together and truly appreciate your sweet comment. I'm gladly following ya now and can't wait to try this recipe. It looks amazing and I am a lover of flan. Nicole, I'm glad you stopped by. Hope you try it, and enjoy it as much as my husband does, feel free to ask any questions and let me know how it goes. I follow you on twitter and hope we can keep in touch, also you can find us on www.facebook.com/craftyspices. Thank you, and hope you are having a great 4th of July. This looks delicious! I have always loved flan but have been afraid to try making it because I've never had much luck with custards. I do have one question though. When you put the water into the larger pan (to create the double boiler) should it be cold, hot, or lukewarm? Does the temp of the water matter much at that point? Here from the Weekend Blog Hop on At Home Take 2! Thanks so much for visiting, I as well have been following you and like what you offer. As for your question (a very good one by the way), I recommend that the water be lukewarm, the reason for this is: if the water is cold the caramel will crack as soon as it touches the water, if it is hot depending on the type of pan and on how fast you pour the mix into the caramelized pan, the caramel would start to melt. 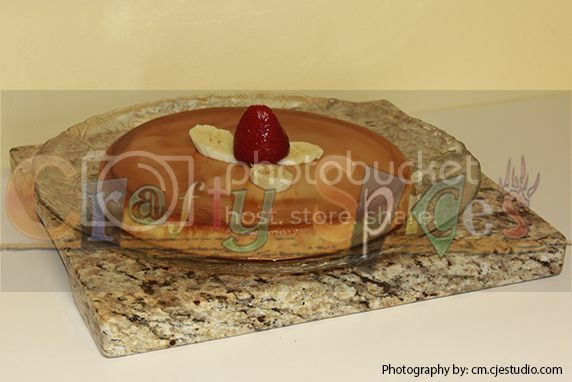 Neither of the aftereffects are critical and they would not affect the flan itself, except for the caramel over it. Thanks you, and hope you are having a great 4th of July.